On the 24th of March there was a meeting between Mr. Andrey Yermak, the Head of Garnet International Media Group, and HE Mr. Manoj Kumar Bharti, the Ambassador of India to Ukraine. Mr. Yermak and Mr. Bharti discussed the possibility of cooperation and the project of international co-production movie "Mahatma Khavkin". The parties expressed great interest in joint realization of this project. 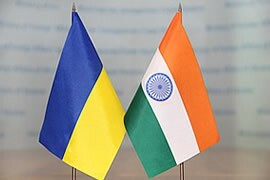 During the meeting Mr. Yermak underlined that such cooperation would be a huge step in strengthening of partnership between Ukraine and India, a great opportunity to revive the names of famous people who have made an invaluable contribution to the development of science and medicine, as well as to tell the world a story based on real events and to unite our nations.